If you’re rearranging your walk-in closet, or you’re having one built to enhance your master bedroom, then there are plenty of things to consider. Where will you put new shelves? How high will the hanging rods be placed? Whether you’re renovating the space yourself or you’ve hired a professional, one of the primary aspects that cannot be forgotten is the lighting. You need to be able to see when you’re picking out clothes or putting together an outfit, and the right lighting will go a long way in the functionality and efficiency of the space, not to mention your enjoyment of using the closet. 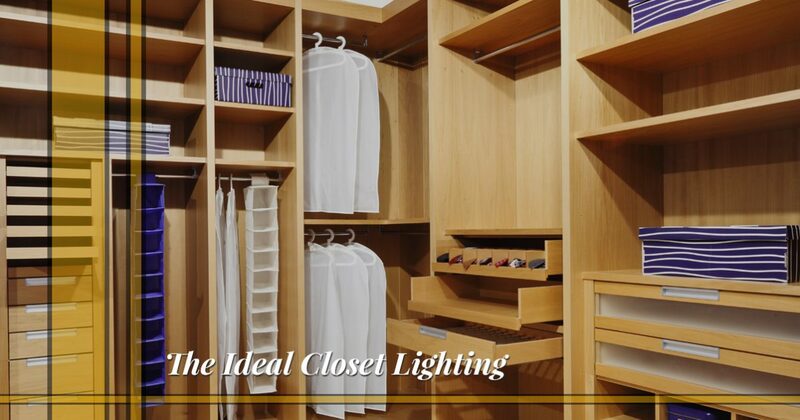 At Passion Lighting in Grapevine, we can help you find the ideal closet lighting options! Your walk-in closet may be situated on an exterior wall, meaning that there might be a window in the space. Natural light can be great in a closet, but it’s really only beneficial in the morning, and you most likely use your closet at all times of the day. Finding overhead fixtures that can complement the natural light and also provide illumination when sunshine isn’t present. The main fixture should provide general illumination that makes it easy to turn on the light, walk in, find what you want, and walk out. While your main fixture provides enough light to see by, you sometimes need more illumination while you’re looking for the right shoes or the perfect tie. Your closet most likely has shelves and drawers, and light from the ceiling fixture may not reach every nook and cranny. Under cabinet and drawer lights can be a great addition to a closet, and they’ll help you see when you’re looking through your wardrobe. Chances are you have a full-length mirror in your closet so that you can see what you look like in a new outfit. Lighting is essential in seeing how a shirt or blouse fits on your frame, and you’ll want to be sure you have the right bulb temperatures so that you can see what colors truly look like against your skin tone. Our expert lighting staff can help you find the right bulbs and will gladly explain color temperatures for your recessed lighting, overhead lighting, and more. You use your closet every single day, and if you’ve noticed that the lighting isn’t quite right, visit our showroom today. We can take a look at your new design and layout and help you choose fixtures that fit, or we can help you come up with the initial design that will reinvent how your closet looks, feels, and functions! 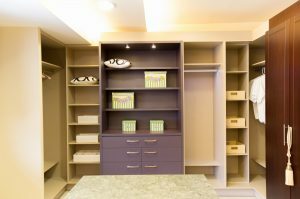 We love working with homeowners on any type of project, and while the closet can often be forgotten about when it comes to lighting, it doesn’t mean that it isn’t worth the time to update. Our store is open Monday through Saturday, and no matter where you live in the Dallas/Fort Worth area, you can find the ideal fixtures in our showroom.